first soak 2 tsp sabja seeds/sweet basil seeds/tukmaria seeds in � cup water for about 20 to 30 minutes. later strain them with a tea strainer and keep aside. prepare 3 tbsp falooda sev according to package instructions. some require just soaking the falooda sev in warm water. i had to cook them in boiling water much like noodles. if you need to cook them, then do boil them in water till they are softened. strain them and keep aside till they are cooled. substitute for falooda sev can be rice vermicelli or wheat vermicelli. in a mortar-pestle crush 1 tbsp pistachios coarsely. keep aside. take 1 cup milk in a small pan or sauce pan. add 3 to 4 tbsp sugar. then add the coarsely ground pistachios. add 25 to 30 strands of crushed saffron. put on the flame and gently heat up the milk. simmer on a low flame. stir so that the sugar dissolves. you just need to heat the milk and not boil it. keep the kesar pista flavored milk aside and allow to cool it completely. you can also refrigerate the kesar pista milk, if you plan to assemble the falooda later. once the milk has cooled, add 1 to 2 tbsp sabja seeds in a glass. then add 1 to 2 tbsp of the falooda sev. add 2 to 3 ice cubes. then add ⅓ to � of the kesar pista milk. depending on the size of the glass, you can add ⅓ to � of the flavored milk. again add 1 to 2 tbsp of the sabja seeds and the falooda sev. top up with 1 to 2 scoops of vanilla ice cream or kesar pista ice cream. top with some sliced or chopped pistachios and cashews/almonds. serve kesar pista falooda immediately. 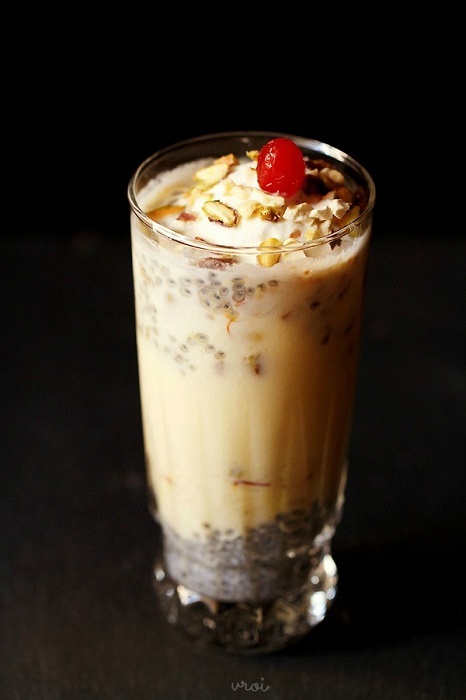 prepare 1 or 2 more glasses of kesar pista falooda this way.